Team Saskatchewan and skip Amber Holland wins the MVP award after winnning the 2011 Scotties Tournament of Hearts, February 19-27, Charlottetown, Prince Edward Island. 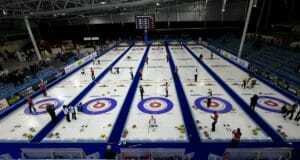 The Canadian Womans Curling Championship. Skip Amber Holland was fittingly declared winner of the Sandra Schmirler MVP Award during the closing ceremonies at the Scotties Tournament of Hearts in Charlottetown. The Award is named in honour of the late Saskatchewan skip who won three Canadian and World titles and the Gold medal at the 1998 Winter Olympics. It recognizes outstanding play during the playoffs at the Scotties. The Shot of the Week Award was also presented. This Award goes to the curler judged to have made the most outstanding shot during the entire championship. This year’s winner was Saskatchewan skip Amber Holland. 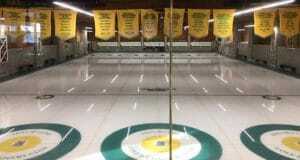 The shot happened in the 6th end of today’s final game between Saskatchewan and Team Canada. Saskatchewan was trailing by a score of 6-3 with last stone. With her last rock, Amber squeezed around a front guard and tap backed her rock to take 3 and tie the game 6-6. First and second All Star teams were announced earlier with Team Canada claiming all of the spots on the First Team. The teams were selected based solely on their statistics during round robin play. Leading the stats on the First All Star team was lead Dawn Askin (90%), second Jill Officer (84%), third Kaitlyn Lawes (81%) and Jennifer Jones at skip (83%). The Second All Star team included three Saskatchewan team members; Amber Holland at skip (79%), Kim Schneider at third (80%) and Tammy Schneider at second (83%). At lead, was Alberta’s Chelsea Bell (86%). The Joan Mead Builder’s Award went to Canadian Curling Association, National Team Coach, Elaine Dagg-Jackson. This Award recognizes significant contribution to the growth and development of women’s curling in Canada. The Award is named in honour of the late Joan Mead, a CBC producer who is credited with many ground-breaking advances in televised coverage of the sport. 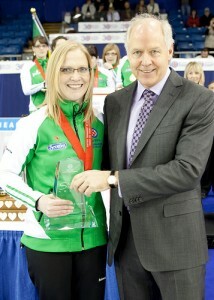 The Marj Mitchell Sportsmanship Award was presented to popular Manitoba Skip Cathy Overton-Clapham. This cherished Award is selected by the curlers themselves and is named in honour of the late Saskatchewan skip who won the first women’s World title in 1983. 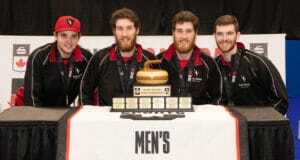 This is the first time a Manitoba curler has captured the Award. Team Saskatchewan will represent Canada at the Capital One World Women’s Curling Championship in Esbjerg, Denmark, March 18 – 27. Next: Canada through to Playoffs at 2011 World Wheelchair C.C.